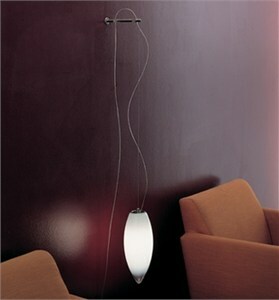 Unique teardrop-shaped wall bracket light in white-shaded crystal mouthblown glass. Made in Italy. Design: Mauro Olivieri. Dimensions: 4.75"W X 11.5"+47"H. Uses 100W E26 (E26 Med. Base Incand. A19) bulb.